I expected this to do better. Pesky voters! like the spider. is he helping him up, or stepping on his hand! Oh wow. I don't like daddy long legs. They scare me. The idea is really good, though. I think that the focus may have been too soft, though. Composition is well done. Best in show, I think. whoooh..love the spider addition! It makes the photo that much more exciting! Great shot! Nice visitor there. Tobad the head is not rolled back looking up. This angle just feels off to me as he is looking down. Maybe a rotation 90 cw... might give a stronger feel. I like the perspective and the composition. Very good composition and lighting. 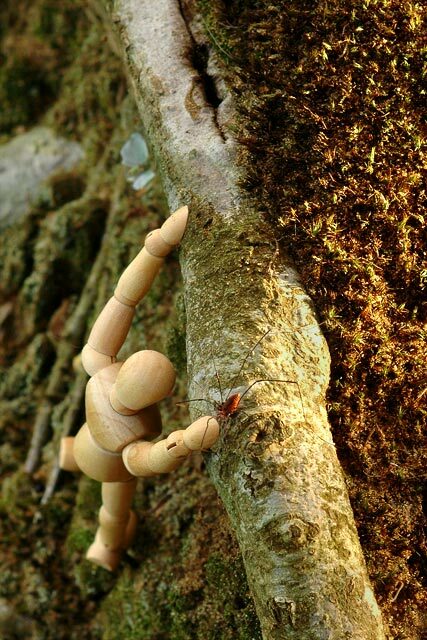 Bonus for the daddy longleg trying to save Woody! Nice idea and capture of the feeling with depth. Focus appears to be on right, would be better on woody, and consider cropping out some of the right side. Good thing he does not have archniphobia! This is wonderful, and the spider is a great addition! Proudly hosted by Sargasso Networks. Current Server Time: 04/19/2019 08:18:22 AM EDT.